A 31-year-old Spaniard who was given the world’s first full face transplant four months ago, has this morning appeared at a press conference alongside the doctors who performed the procedure, at Barcelona’s Vall d’Hebron University Hospital. Following a shooting accident five years ago, the man, identified only as Oscar, could only breathe and be fed through tubes. During a 24-hour operation, he was given a new nose, lips, cheekbone, lower and upper jawbone, palate, teeth, skin, and muscles. There have been 12 partial face transplants–most famous was that of Isabelle Dinoire five years ago, after she was mauled by her dog–but this is the first full transplant to be carried out on a patient. Farmer Oscar had previously undergone nine operations at another university, and was, after psychiatric evaluation, thought to be an idea candidate for the full-face transplant. Life is still, however, difficult. 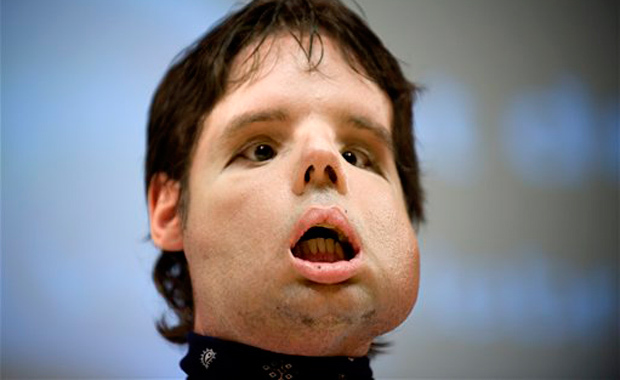 He cannot close his eyes, and has limited movement of his mouth, but the doctors expect him to regain 90% of his facial capabilities over the next 18 months.